Sip, Sip, Hooray. Let's Celebrate National Wine Day! Saturday, May 25, Noon to 6 pm. Come to Crossing Vineyards to celebrate the happiest day of the year. Enjoy specialty cocktails, winery tours on the hour, discounts and more. You’ll be on cloud wine! No cover charge. Check out Dates for: Sip, Sip, Hooray. 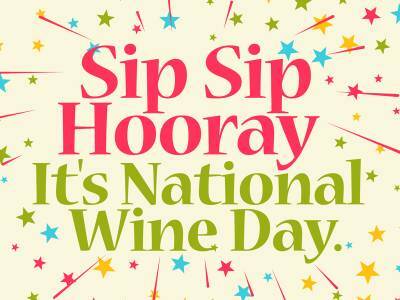 Let's Celebrate National Wine Day!